The Summit is being attended by 4,000 decision-makers from 140 countries including heads of state, ministers and business leaders. It sets the agenda each year for the next generation of governments, focusing on how they can harness innovation and technology to solve universal challenges facing humanity. It provides a unique platform to showcase and exchange best practices and smart solutions to the challenges that nations face. The World Government Summit is a neutral, non-profit organization at the intersection of governments and innovation. 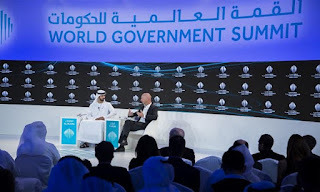 The World Government Summit functions as a knowledge exchange platform for leaders in the public and private sectors to convene and collaborate with world-renowned experts to create a positive impact for citizens worldwide. The Organisation comprises a wide network of leaders of the public and private sectors and inspires them to think collectively and creatively about disruptive intersections between governments and innovation, with the ultimate goal of promoting development and prosperity. Q. Where is the seventh annual World Government Summit being held?